After she is found guilty of witchcraft, Adele Karnstein is sentenced to death by burning but, in the tradition of all wronged sorceresses, she swears unholy vengeance on her accusers, the royal Humboldt clan. The truth of the matter is that unctuous Kurt Humboldt (George Ardisson) has in fact framed Adele for his Uncle Franz’s murder when it was he that had bumped the blue-blood off when Franz sought to disinherit him. 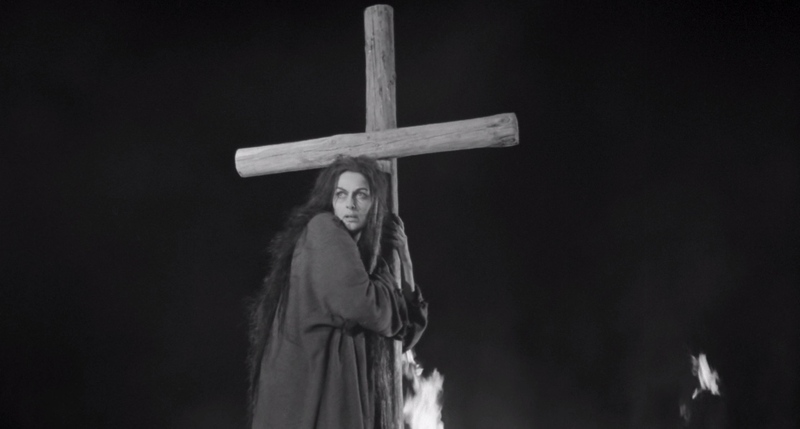 To add more oil on the karmic fire, Kurt’s lecherous father (Giuliano Raffaelli) elicits the sexual favors of Adele’s eldest daughter Helen (Barbara Steele) when the woman seeks him out to stall the ritual that will end her mother’s life. Not only does the auto-da-fé go on without the Count’s consent, but the old man later tosses Helen into a river when she threatens to expose him. Years pass and Kurt begins to set his sights on wooing Helen’s orphaned sister Lisabeth (Halina Zalewska). When Kurt claims his prize in marriage, a mysterious lady named Mary (Steele again) enters his life and he’s soon up to his old philandering ways. But the villain will soon come to discover that the enigmatic Mary has arrived on the scene to set the machinations of his final judgment in motion. 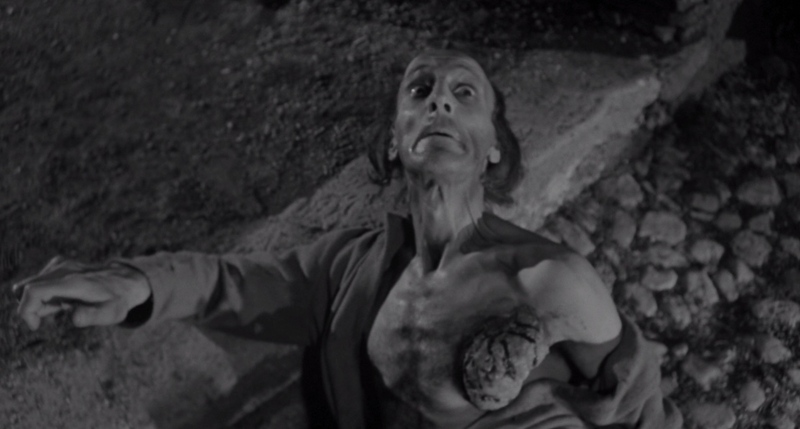 Though not as famous as director Antonio Margheriti’s own Castle of Blood (1964) which also starred Steele and would go on to be remade twice by the filmmaker, The Long Hair of Death is a sumptuously filmed and surprisingly canny entry from Italy’s line of Gothic melodramas. It’s not as phantasmagoric in its landscape as other Euro-Goths, favoring instead a slightly more visceral impact with its images of burning scalps and earthy sensuality. There’s still enough macabre grue on hand to satiate the palate of those who watch these films primarily for their art direction. 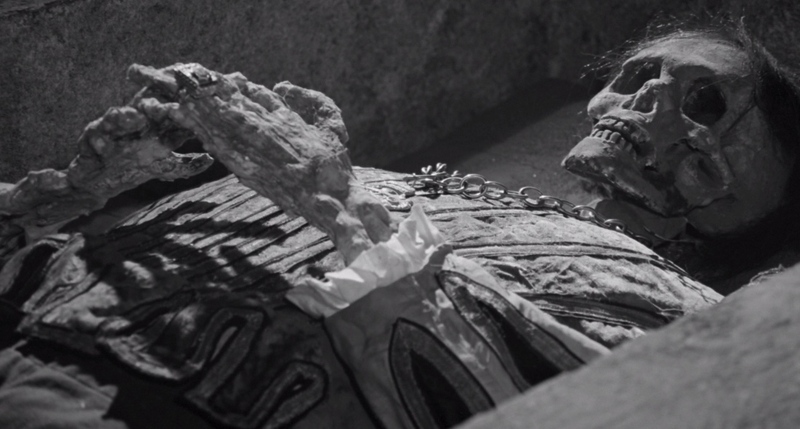 Margheriti composes potent shots such as Helen’s scattering of her mother’s ashes in the wind, and the deaths-head effigy covered in peasant hair that figures in a climax predating The Wicker Man (1973) is a stunner that viewers are unlikely to forget once seen. Riccardo Pallottini’s camera roves throughout the ancient castle, the sepulchral shadows of crypts and tombs filled with ominous portent. For as much as the movie may owe to those that came before it (a cadaver’s sudden, shuddering breath recalls a similar incident from Black Sunday), The Long Hair of Death is refreshing in its reneging of old concepts and the energy it puts forth in depicting them. As eerie as Ivo Garrani’s resurrection might have been in Bava’s film with its spidery claws and leering demon mask, the scene of the newly revived Helen strutting into the chapel after a bolt of lightning has brought her back from the grave is undoubtedly more thrilling. Margheriti does a truly wonderful job orchestrating the tension here as a character’s recitation of apocalyptic passages from the Bible, Humboldt’s mutterings of approaching death paired with the raging storm, and the sharp drop of a ring build up to that final moment when hell breaks loose and busts the doors wide open. The film has a clockwork precision in its storytelling. There are some logical missteps (why would Helen not tell Count Humboldt who Franz's true murderer was and consent to being fondled instead?) and convolutions of plot (Kurt’s scheme to kill Lisabeth includes inducing catatonia through a drugged draught, sealing her in a coffin to asphyxiate her, and then sneaking her body back into her bedroom so that she may be discovered to have died “naturally”), but in watching the picture these will hardly register on the viewer as they await the cosmic kick in the pants that they know is in store for Kurt. Though Steele is clearly the headlining act here, the film really belongs to Ardisson who does a more than admirable job of portraying a morally bankrupt fool while always keeping the viewer interested in his plight. He is the despicable villain whom we wish to see punished in the end, and he is especially effective in gaining our disdain in moments like when he sneers at the recently-defiled Lisabeth on their wedding night and says “Now you are mine.” While his demise might strike some as a touch too outré, his E. C. Comics-fashioned death is certainly fitting for his unrepentantly nefarious character. The title, by the way, is not merely a poetic affectation but a symbol that turns up at several distinct points in the story. The context in which it is always seen (traces of Lisabeth’s visiting spirit; dressings on the reaper effigy; covering the face of a festering corpse) colors it as more of a creeping disease than an attractive human adornment. One character deems hair as a sign of mankind’s vanity, and its appearance in the film is always linked with the gruesome and the unnatural. We don’t truly understand how disgusting a full head of hair on a cadaver is until we see it. That is Margheriti’s gift to us. Another rarity amongst films of this type: in addition to the rotting familial core that is at the heart of the story, we get glimpses of the outside world as well. As predicted by Adele, the streets become lined with cadavers, victims of a sweeping plague, with the blaze of bonfires matched in intensity only by the collective wail of the villagers as hooded monks collect their gruesome burdens. The witch’s curse has induced madness in not just her persecutors but in the world at large. 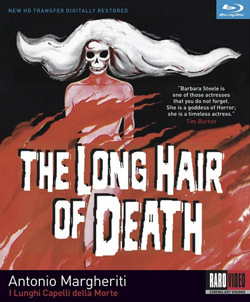 But perhaps the most intriguing aspect of The Long Hair of Death is how it manages to incorporate facets of both the period-piece melodrama and Hitchcockian thriller in its latter half without any signs of stress. Kurt’s mounting dismay and delirium is shared with the audience as he tries to comprehend how the thought-to-be-dead Lisabeth is being seen around the castle and leaving him insidious clues without him being able to track her down. Even though we may foresee the supernatural end game, it doesn’t make the chase any less exciting. The score by Carlo Rustichelli is invigorating and tempestuous in equal measure, stirring up a mood of doom with weird whistles that are reminiscent of Robert Corbet’s later orchestrations for Dark Shadows. The music sounds like the sweeping sickle of Death on his pale horse coming to bring about the dark ages. 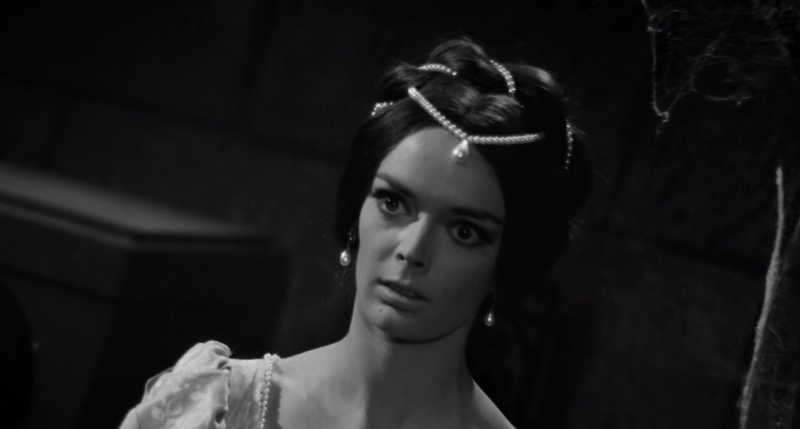 And in this film, the beautiful face of death belongs to Barbara Steele, as it should be. Raro Video has done another solid job of updating an Italian genre picture for the home video market. The Long Hair of Death has been the subject of seemingly endless public domain versions over the years, and some of the problems that plagued those iterations have carried over to this new Blu-Ray including several noticeable instances of print damage, but for the most part this disc is exceedingly clean and sharp when stacked against those bargain bin affairs. While the monochrome photography is generally strong and crisp throughout, there are a handful of shots that appear to be softer than those that bookend them (take the bit towards the end where a partier tells Kurt of seeing Lisabeth, for instance). The audio track is similarly consistent, though one may notice the presence of a constant hiss underlining the proceedings. The Long Hair of Death thankfully doesn’t suffer from the conflicting translations that Raro’s disc for Slaughter Hotel did between its English subtitles and dubbed track, both versions offering details and phrases that generally hew closely together. There are some odd errors that mar the easily-readable subtitles, such as when one character says “I’d like you too to…” and a case of mixed-up syntax when Count Humboldt tells Kurt “Until I’m alive, you will do as you’re told!” For some reason there is no capitalization of titles such as “baron” and “count” even when accompanied with the characters’ names either. The main menu is nicely manageable, and viewers may choose to return to it as the film plays, an option not available on the Slaughter Hotel disc. Twelve chapter stops appear on the menu when selected. The disc denotes the selection of a scene, feature, or sub-menu with a little hissing sound, for whatever reason. The Fangoria editor offers up a heartfelt assessment of the film that mainly centers on the black magic looks of Ms. Steele. Alexander calls the movie the “art film” of the European Gothic bunch and likens it to the “secret handshake” amongst fans of its more obscure charms. Many of his points are referenced in both the notes and the video, so there tends to be repeated information between the two. Reporting from Dario Argento’s museum of horrors, Antonio’s son Edoardo reminisces about his father’s work and their own collaborations. Edoardo explains a little history of Long Hair’s production and use of the same sets from Castle of Blood. Other details such as Antonio’s passion for science fiction and special effects, his desire to do a third remake of Castle, and his habit of working in all departments of production are offered with fond remembrance by the younger Margheriti. Screenwriter Tentori (A Cat in the Brain) is featured in the second interview on the disc, discussing Margheriti’s “native bent” for horror films and the atmosphere of “morbid eroticism” that underlines the supernatural-revenge plot of The Long Hair of Death. Tentori speaks mainly from the standpoint of a fan, and his passion certainly comes through in saying that Margheriti deserves to be rediscovered. Thankfully the advertised trailers have made it on to the disc, as was not the case with Slaughter Hotel. 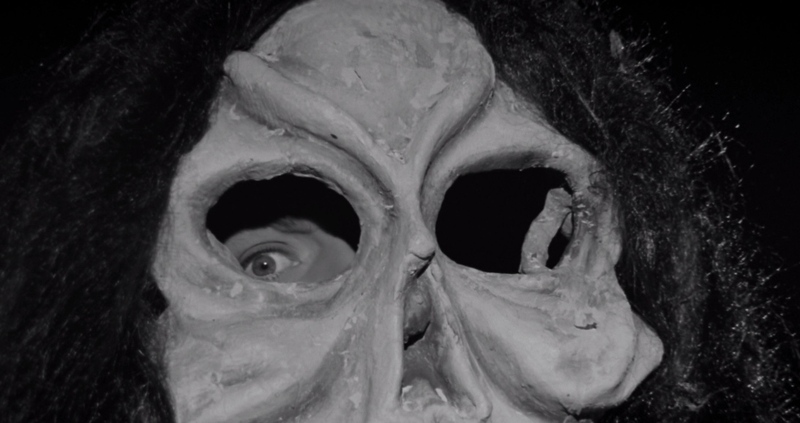 Both use much of the same footage and display Margheriti’s anglicized pseudonym “Anthony Dawson.” The English trailer features a brooding narration similar to that heard in the American preview for The Mask of Satan (1960). However, the trailers tend to give many of the film’s plot points away, so it is best to view them after watching the movie in its entirety.